Vintage - Sadler Fine Bone China Tea Pot with Lid, Made in Staffordshire, England, Brown with Blue & Green Stripes, Circa 1950's. 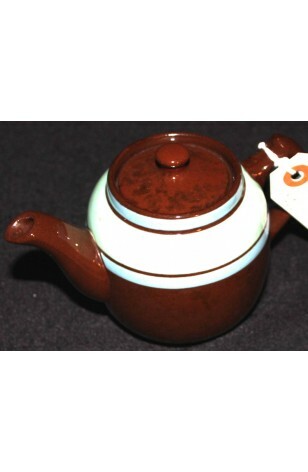 Beautiful Tea Pot with a Deep Rich Brown Glaze, with Bands of 1 in Green, and 2 in Blue. This Tea Pot is a Lovely Piece, which Stands about 3.5" T. Made by Sadler Fine Bone China of Staffordshire, England. A great addition to a Tea for One Collection. Great Condition.